The “roaring” Twenties didn’t start very cheerfully in France (where our heroes live, when they’re not vacationing on disputed territory at the Adriatic Sea). Everything was scarce after the devastating war, and prices were on the rise. For Lou and Mayann, this is not a problem – the US dollar is strong, and the bulk of their Paris audience consists of North and South American tourists, war profiteers and “goulash barons”. 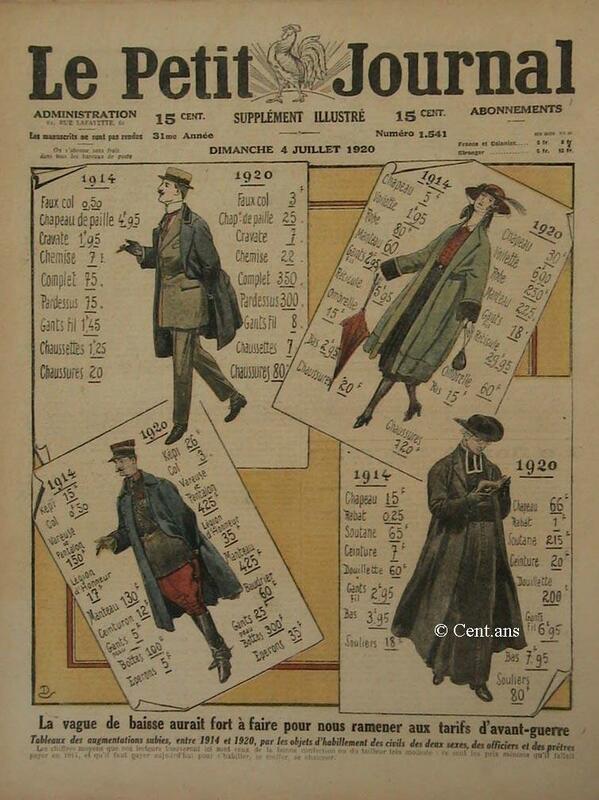 Inspired by this front page of Le Petit Journal, July 4th, 1920. Poor Falco … Do you know how much the Franc of 1920 was worth? The New York Times ran some articles on the subject in January, 1920. I wonder if any general newspaper would bother to publish this type of detailed information today? Exchange Rate Is at the Lowest Point in the History of the Country. Cost of Some Necessities Is 300 Per Cent Above That of 1914. Demand That Rich Bear a Larger Proportion of the Burden Expected in the Chamber. PARIS, Jan. 2. – … Millionaires pay relatively much smaller taxes in France than in America, and the new rise in the price of public service and of bread, sugar, and clothes naturally affects the poor and the middle classes much more than their more fortunate brethren. … Paris is in the throes of a money-spending debauch perhaps unequalled in her history. Nouveaux riches on all sides give “loud” evidence of their wealth, while it is becoming increasingly difficult for workmen to make both ends meet. And a list of what you would get with your francs in 1920 (prices of 1914 in brackets). I’m still looking for figures on how much workers and tradesmen earned during this time. Hmm, potatoes were quite affordable compared to other food. I think I just found one or two fun plots for short stories in these articles! Strikes, demonstrations, Montmartre seceding from France in protest against curfews for cafés and electing its own government… Facts beat fiction again!